Entry filed under: corn, hay, soybeans, wheat. 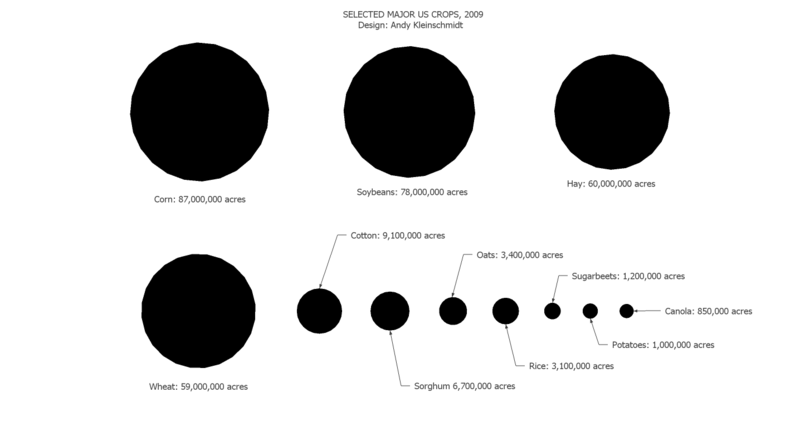 Tags: major us crops. Thanks for the comment Lars. I wasn’t going for geometrically correct circles based on area, rather, I was illustrating a point with a focus to raise awareness of agriculture. I think, though, that you raise a valid point about the original graphic being misleading. That was certainly not my intent. I have updated the graphic using geometrically correct circles based on area for exact comparison. Thanks! I love charts like this, even when they are about things I don’t care a bit about. Please overlook my inner editor. He’s unbearable at times. (Be glad you don’t have to live with him constantly, as I do.) Instead, accept my attaboy for an interesting post. There used to be some fields of asparagus along US 127 north of Van Wert. I don’t recall when they disappeared. Maybe 1960 or 1970? Raising tomatoes was back-breaking work, and I hated it at the time, but today, most NW Ohio farmers don’t raise food at all. Of the 11 crops you list, only 2 of them are actually food – rice and taters – instead of products that are processed into food, feed or fiber. Sometime when you have some time, it’d be interesting to see the top ten food crops, and see how they compare to field corn, wheat, soybeans, etc. Whenever I see a comment has popped up on my blog I hope it is from you Harl. Your comments are always great! Thanks for sharing your opinions here. Good idea on the the top ten food crops!